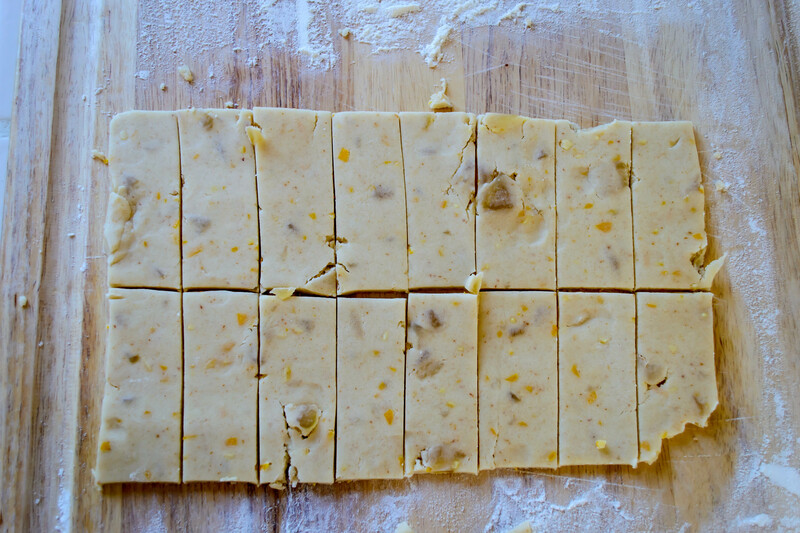 cookie dough | "blackberry-eating in late September"
Inspired by numerous sources, but mostly the deep golden orbs on my backyard lemon tree and a winter-blues-banishing post from Hannah at Inherit the Spoon, this post had to be about shortbread. This is a cookie of the most basic sort, crisp and sandy, with only the three essentials: flour, butter, and sugar. No leavening to worry about, no eggs to tussle with (incidentally, do you know how hard it is to crack eggs without making a mess when you’ve sliced the tip of your thumb and it’s therefore awkwardly bandaged? ), just the base, the sweetener, and the fat. These are, as Ruhlman points out in Ratio, an “adult” sort of cookie. Dry, unadorned, plain, but equally ideal for a dunk in tea or chocolate ganache, and amenable to all sorts of attempts to “play dress-up,” which makes them not just easy and tasty, but suitable for kids-at-heart. Recently I’ve become obsessed with the combination of lemon and ginger. 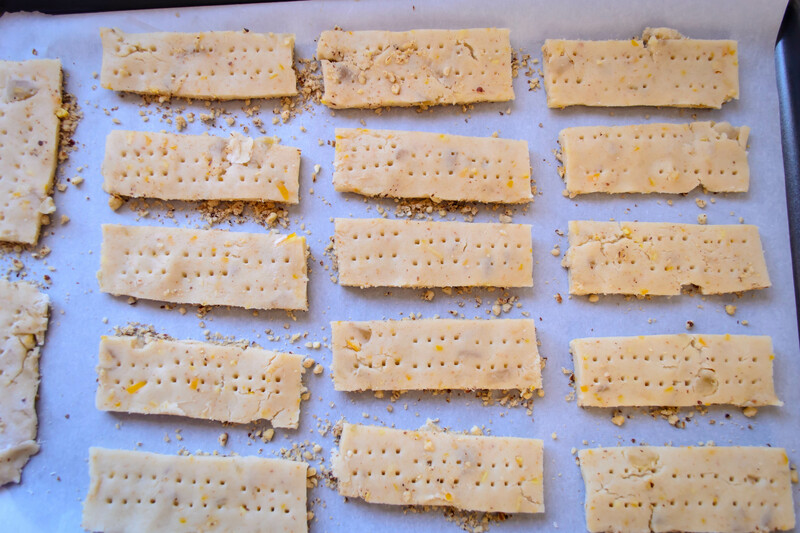 Hannah’s citrus shortbread and my tree with its laboring, weighty boughs all but begged me to try this combination. When a quick web search turned up only recipes featuring one or the other, I knew I had to insist on their marriage in my version. Then insanity struck. I got the ridiculous notion that I wanted to create a hazelnut “crust” for these cookies. Yes, that’s right, I decided to add a crust to a cookie that is commonly used itself as a crust. I’m not sure where this idea came from, although if I must place blame it’s going to be on my sister, who commented at Thanksgiving that I should pursue the lemon-ginger-hazelnut flavor combo because it sounded so outstanding. So really, R., these are for you. I scoured multiple recipes to put this dough together, checking the likes of Martha Stewart, Ina Garten, Paula Deen (who I was surprised doesn’t have more sweet versions), and of course Deb Perelman. But with the exception of a few technique ideas, I came back to Ruhlman’s basic 1-2-3 cookie dough as my backbone (1 part sugar, 2 parts fat, 3 parts flour). The butter, I decided, needed to be browned (another recent obsession). This would add depth and nuttiness in case the crazy hazelnut idea didn’t work out. The ginger would be candied and minced into a sticky pile, and the lemon would be zested into mild spritzy confetti. This made for a dough that, while delicious, was perhaps not the easiest to work with – I refrigerated it too long and was then impatient to roll it out, so there were cracks. I rolled it quite thin, which made the cracking worse, and created a painfully delicate cookie. The chunks of ginger, too sticky to mince very finely, stood up like carbuncles through the buttery dough and made slicing difficult. The hazelnuts I pulverized in the food processor with some ground ginger (in case the candied chunks didn’t come through) and a healthy sprinkling of turbinado sugar. Faced with a bread board of delicate cookies on one side and a pie plate full of hazelnut crumbs on the other, I almost opted to forget the whole “crust” idea altogether, but I’m glad I didn’t. 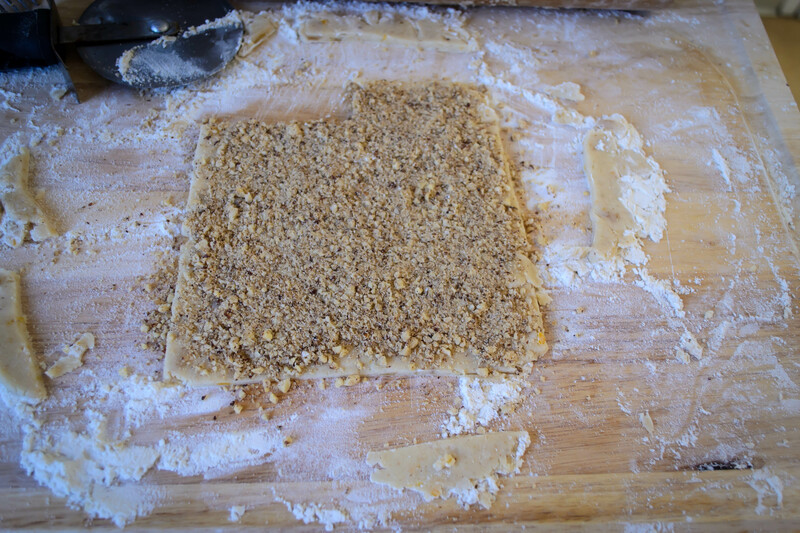 You can transfer crumbs to cookie in a number of ways, including pressing the cookie into the crumbs, which I don’t recommend (they adhere only reluctantly and the raw dough tends to break), or mounding crumbs on top of the cookies and pressing them in with a rolling pin, which I do recommend. Then you can gently lift the cookie and flip it quickly and firmly onto a parchment lined baking sheet so the hazelnut layer is on the bottom. The crumbs will try to scatter. Don’t let them! Press the cookie down lightly but firmly back into the crumbs, and they will adhere as they bake. When they came out of the oven, they were too soft to move. They needed a good five minutes alone on their baking sheet, undisturbed, to cool and crisp. But once crisp, they were perfectly sandy and satisfying, tasting of – I can’t think of a better description – powdered butter. 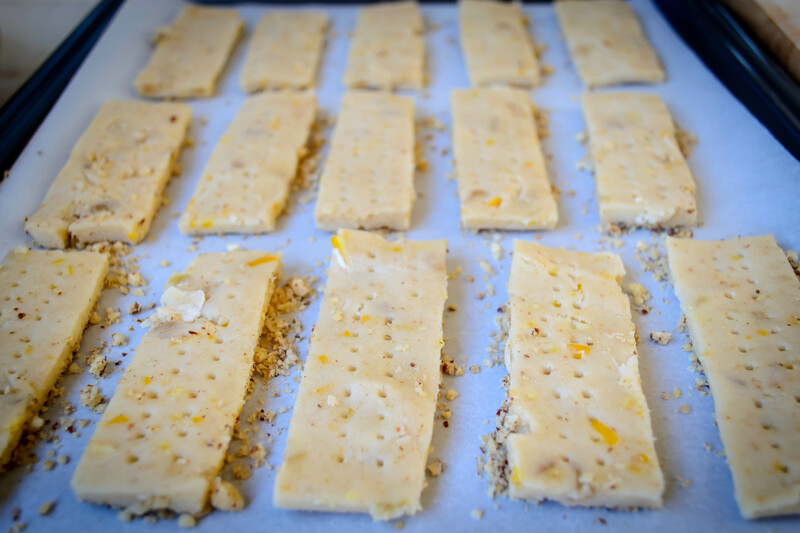 At first I couldn’t detect the ginger or lemon, aside from the now chewy bits of candy distributed through the dough, but a day later, and then two days later, the more delicate flavors started to shine past the overwhelming richness of the brown butter. The hazelnuts, with their earthy crunch, were perfect the whole time. You could probably mix the nut crumbs in with the rest of the ingredients and save yourself a bit of time and frustration, but I loved the way they looked as a crisp layer on the bottom. Cookies with their own crust. Glorious. My sister got to taste them during an unexpected visit, and pronounced them delicious. The lemon-ginger-hazelnut trifecta is a triumph. And the leftover ginger-spiked hazelnut crumbs make an excellent topping for oatmeal. Melt the butter in a small saucepan, swirling gently on occasion, over medium to medium-low heat. Once melted, the butter will foam up, then clear slightly, and then the magic: the solids will sink to the bottom of the pan and begin to brown slightly. At this point, turn off the heat. You want this beautiful browning, but you don’t want those solids to burn. There is only a small window between browning and burning, so watch carefully as the butter reaches this stage. Pour the melted butter and browned bits (which you may have to scrape off the bottom of the pan) into the bowl you will use to make the cookies. I used my stand mixer bowl. Stow it in the fridge for 10-15 minutes, or until the butter gets sludgy. 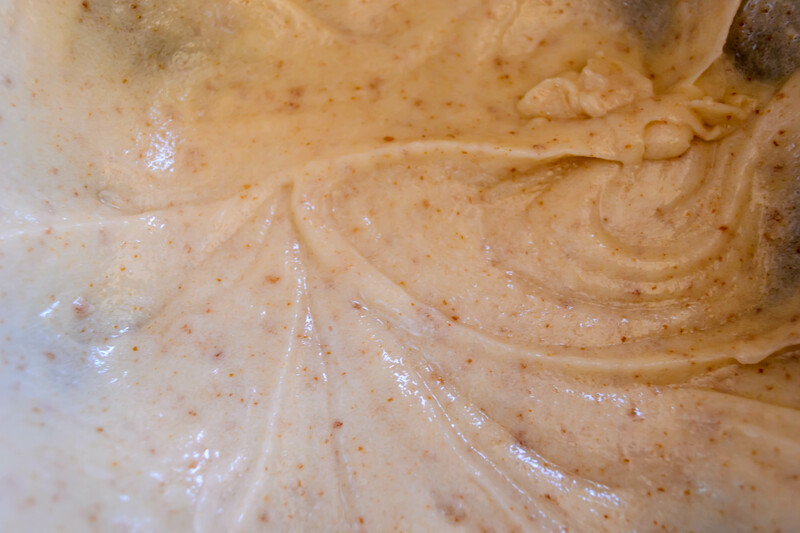 When the butter has solidified a bit, pull it back out and add the sugar, then cream (or goo) well until everything is incorporated and has become a beautiful flecked mixture the rough consistency of frosting. 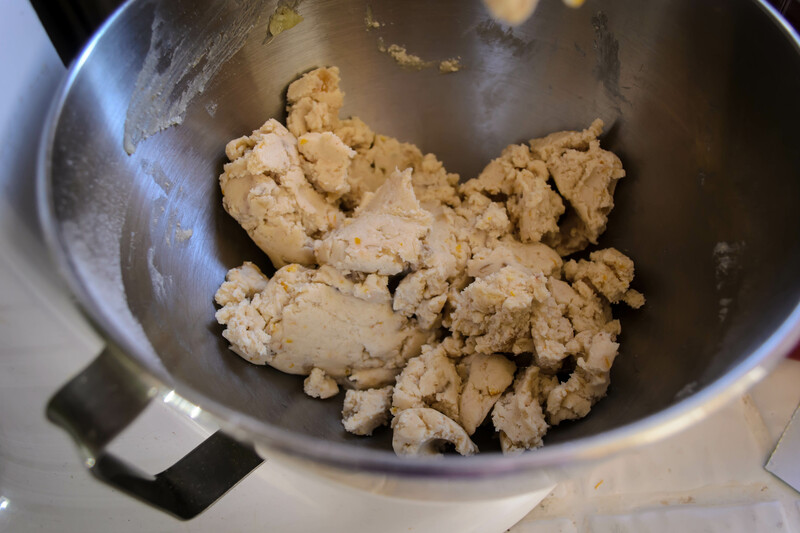 Add the flour and mix until crumbly. Add the lemon zest and the ginger and mix again. First the dough will become large crumbs, then come together into something more like wet sand. This takes a minute or two. If it isn’t coming together right away, don’t worry. The wet sugar and butter mixture needs some time to moisten the flour. Once the dough is the consistency of wet, packable sand, dump it out of the bowl onto a sheet of plastic wrap. 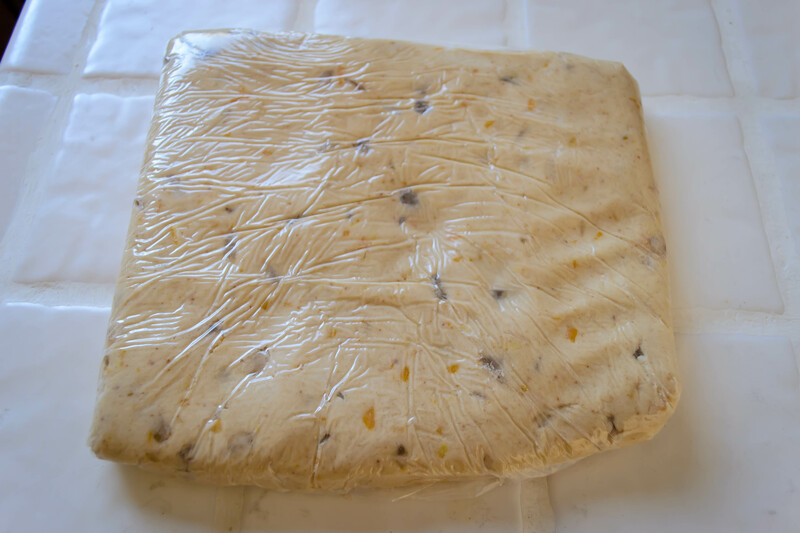 Using the plastic wrap to help you, shape the dough into a rectangle of 5×8 inches or so, wrap up securely, and refrigerate for about 30 minutes. While the dough chills, pulverize the hazelnuts, ground ginger, and raw sugar crystals in a food processor (or chop finely with a sharp knife) until some of the hazelnuts are reduced to powder and some remain in very small bits. 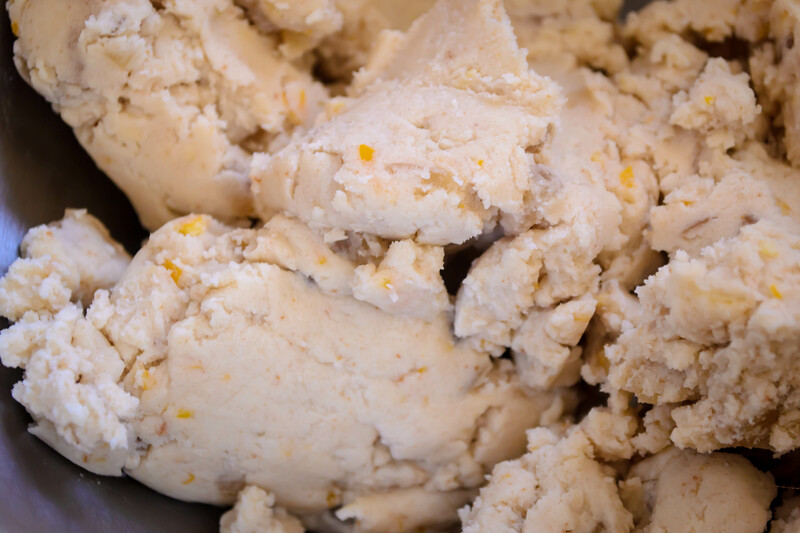 Don’t overprocess – you don’t want this to turn into nut butter. Stop before it becomes moist. When your dough has had a chance to chill, unwrap it onto a floured board and roll or press out to about ¼ inch thick. This takes a bit of patience, especially if you, like me, let it chill for too long and try to roll it out before it’s ready. Cold rolling results in cracking. Just relax, let the dough warm up a tiny bit, and roll gently with a floured rolling pin, patching cracks as you go. This would also be a good time to preheat your oven to 350F. Once you’ve achieved even thickness (minus the odd tall chunk of ginger), use a pizza cutter to trim off uneven edges, and slice the remaining rectangle into smaller rectangles the size of your choosing. Mine were probably about 1×3 inches, which seemed like a nice sized cookie. Now it’s time to add the hazelnut crust. As noted above, you can do this in a number of ways. You can, if you wish, lift the cookies, place them into a dish of crumbs, and press down, hoping for adherence without breaking the cookie itself. This method requires almost excruciating gentleness. 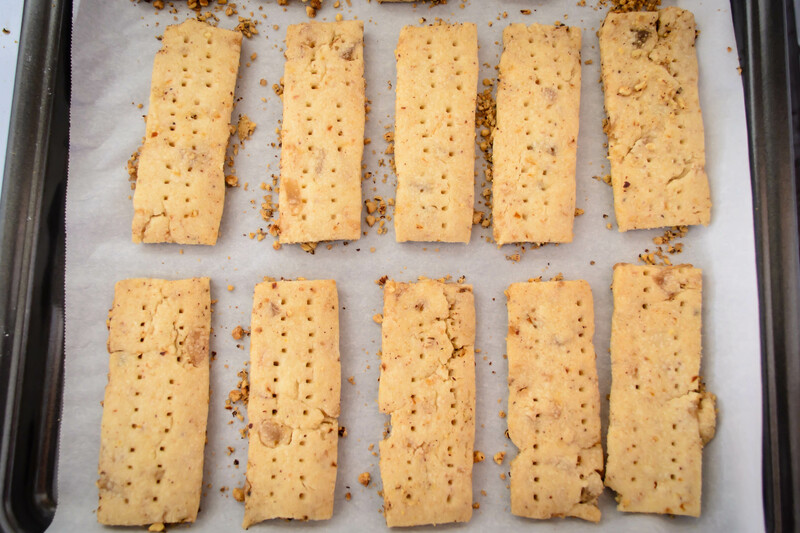 You can also press handfuls of the hazelnut crumbs down on top of the cookies on the board, applying firm but gentle pressure, and then lift the cookies one at a time and invert them onto a parchment lined baking sheet. As you flip, some of the hazelnut crumbs will loosen. That’s okay. 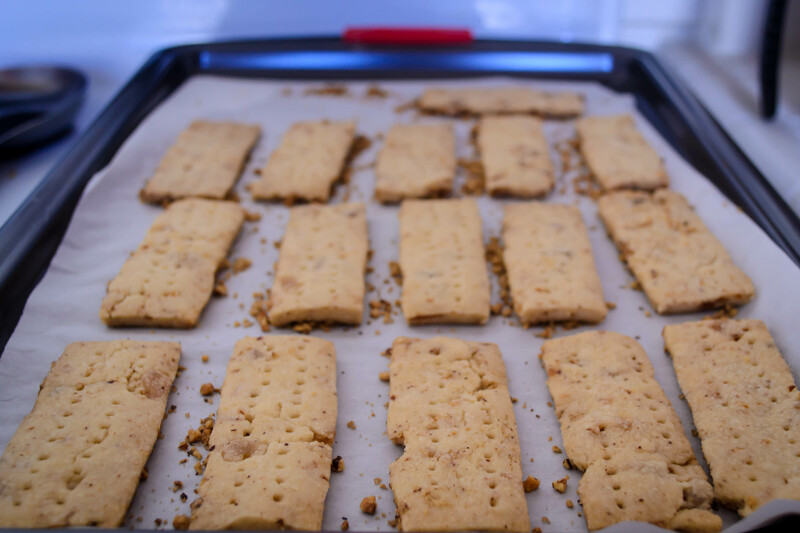 Just get your cookie settled on the baking sheet and then press down again gently but firmly to re-stick the crumbs. 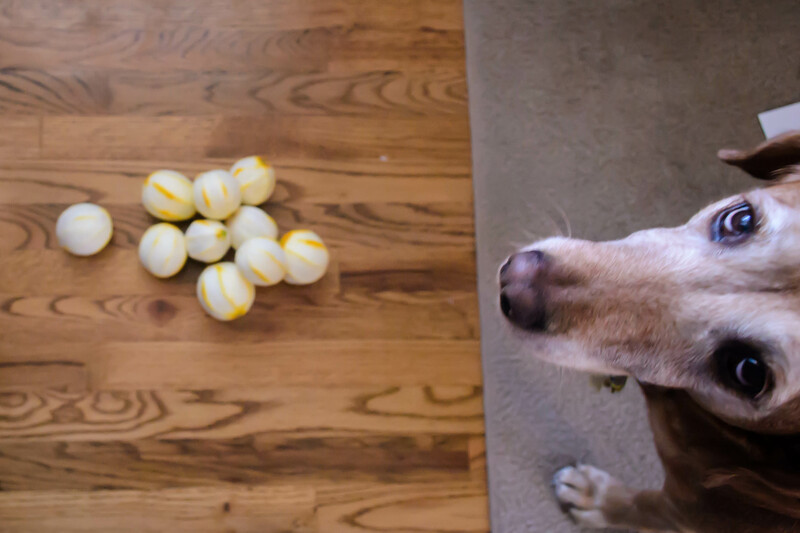 They will adhere better as they bake. 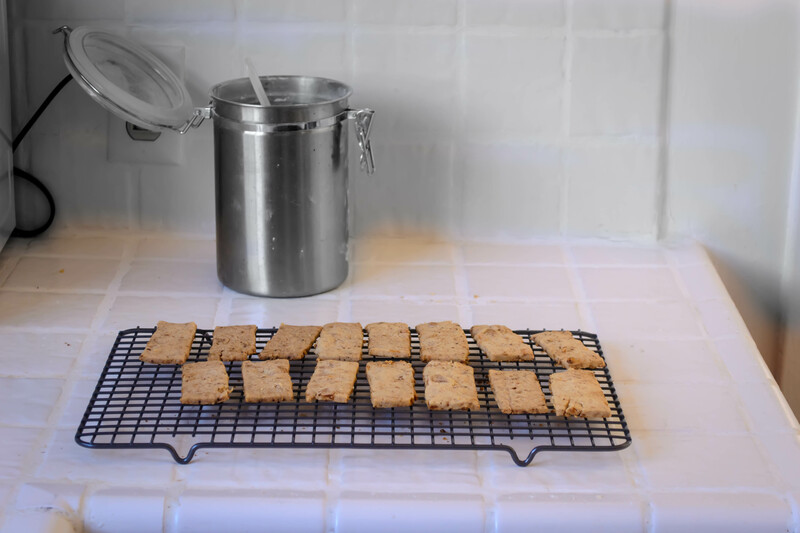 Once you have a full baking sheet (mine each fit 15-18 cookies in various arrangements), pierce the cookies gently with a fork to achieve that pricked look so popular in shortbread, and bake for 18 minutes. 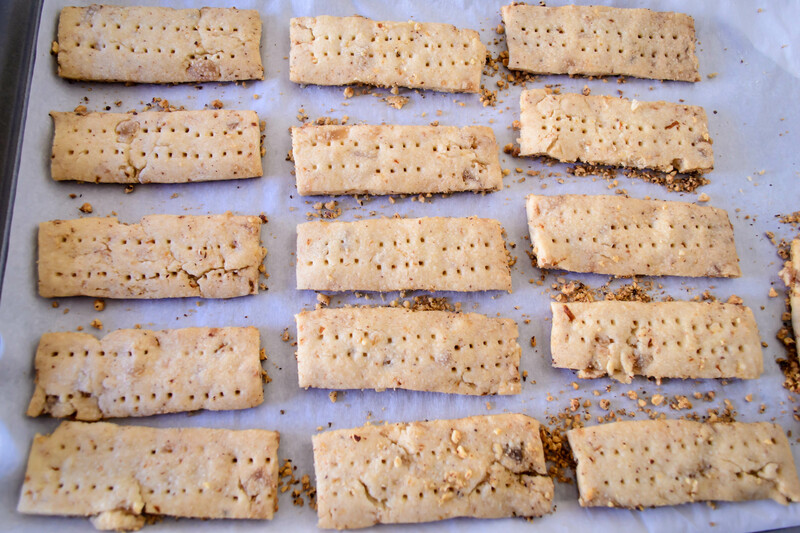 The cookies will become lightly golden all over, and the hazelnut crumbs will darken and get a bit toasty. At 18 minutes, take them out of the oven, set the baking sheet on a cooking rack, and walk away. The cookies need 4-5 minutes to set before you try to move them. They are much too soft at their moment of emergence to transport intact. 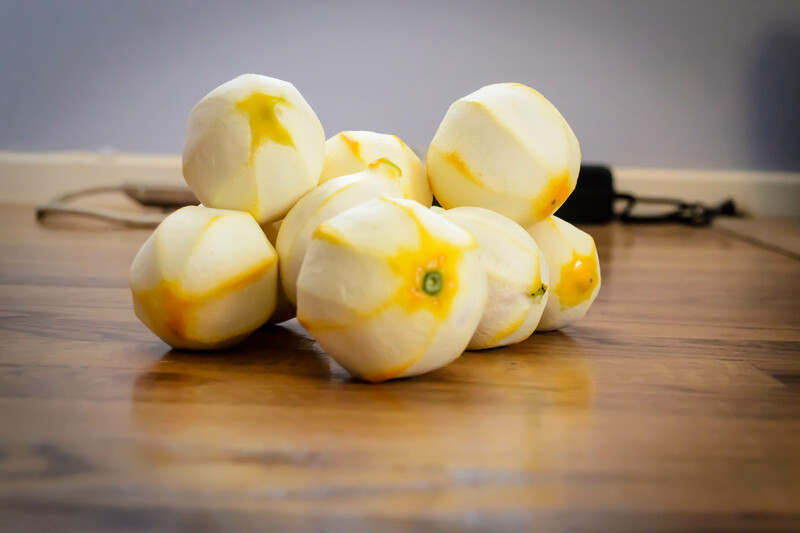 As they cool, they will deflate and crisp up a bit, and you can move them to a cooling rack or a marble countertop or surface of your choice. You can certainly eat these warm, but I liked them better completely cooled. In fact, I liked them better the next day, once the flavors had melded and developed. Stored in an airtight container, these keep deliciously for over a week. They even, wrapped carefully, stay crisp and fresh through the mail. This recipe probably made about 3 dozen cookies, and could have made more if I had eaten less of the dough scraps. I, alas, didn’t make a count before I started sampling, which is always a tasty, tasty mistake.